On Friday 3rd August 2018, Director General of the Institute of Export & International Trade, Lesley Batchelor, spoke to the BBC about the opportunity for UK businesses to increase their exports to markets around the world after Brexit. 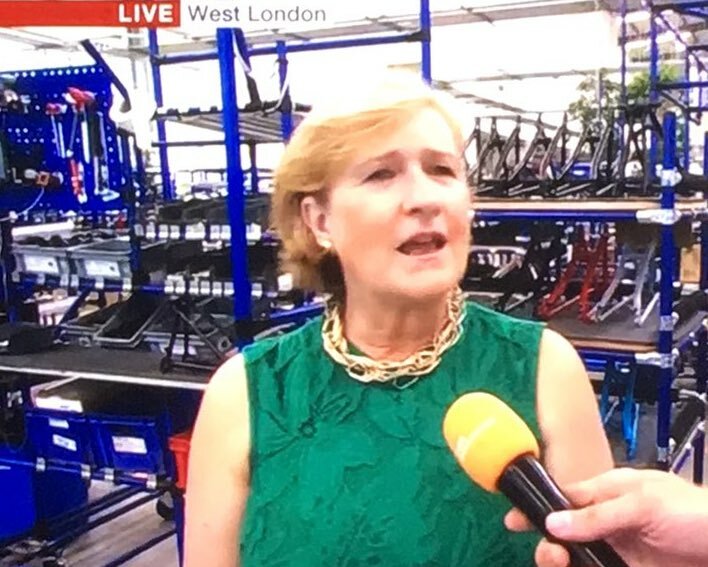 Speaking to the BBC Breakfast show from the factories of Brompton Bicycles, when asked about new figures showing that the UK exports more to non-EU markets than it does to the EU, she said that exporting is a fantastic endeavour for any business to undertake. She added that businesses new to export should look at resources like Open to Export to find out how it’s done properly in order to do it successfully. If you're a business new to international trade, why not look into our New Exporter Membership? Lesley’s comments came on the day that Mark Carney, the governor of the Bank of England, told the BBC’s Today programme of the “uncomfortably high” chances of a no-deal exit from the EU. Commenting on the potential ramifications of Brexit he said that leaving without a deal would be “highly undesirable”, though he did suggest that the prospect remained “a relatively unlikely possibility”. Should a no-deal Brexit occur, he noted that disruption to trade and economic activity would be inevitable, causing inflated prices for a period. He argued that a ‘transition period’ was “absolutely in the interest” of both the EU and the UK, but also noted that the financial system was robust enough to withstand the potential shock of a no-deal. "Our job in the Bank of England is to make sure that those things don't happen. It's relatively unlikely but it is a possibility. We don't want to have people worrying that they can't get their money out. “We've put the banks through the wringer to make sure that they have the capital. Whatever the shock could happen from, it could come from a no-deal Brexit, we've gone through all the risks of a no-deal Brexit. He also added that banks cannot by themselves solve all the Brexit-related financial problems and that the EU still needed to take legislative steps in advance of Brexit. The pound declined following the comments, falling to $1.30 before recovering some of its lost ground. His interview with the Today programme came the day after the Bank of England’s Monetary Policy Committee voted to raise interest rates to their highest rates since March 2009, from 0.5% to 0.75%. He suggested that expectations from the financial markets that interest rates could hit 1.5% over the next thee years were “not a bad rule of thumb, given the current state of the economy”.